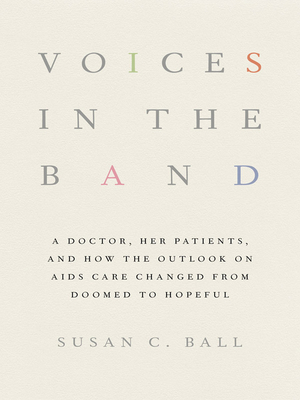 Home » Blogs » julia@bookculture.com's blog » Q&A with Susan C. Ball, author of "Voices in the Band"
Q&A with Susan C. Ball, author of "Voices in the Band"
On Monday, June 22nd, at 7pm Susan C. Ball will be discussing her book Voices in the Band: A Doctor, Her Patients, and How the Outlook on AIDS Care Changed from Doomed to Hopeful at Book Culture on Columbus. In 1992, Dr. Ball began her medical career taking care of patients with HIV in the Center for Special Studies, a designated AIDS care center at a large academic medical center in New York City. Her unsentimental but moving memoir of her experiences bridges two distinct periods in the history of the epidemic: the terrifying early years in which a diagnosis was a death sentence and ignorance too often eclipsed compassion, and the introduction of antiviral therapies that transformed AIDS into a chronic, though potentially manageable, disease. Voices in the Band also provides a new perspective on how we understand disease and its treatment within the context of teamwork among medical personnel, government agencies and other sources of support, and patients. We would like to thank Susan for taking the time to answer our Q&A and for sharing her work with us! How did you come to write Voices in the Band? It’s a book about the AIDS epidemic in the 1990s as experienced in the HIV –care center where I work. It’s stories of patients and colleagues and how we went from having no effective treatment for HIV to seeing it become a chronic illness for those in care. I wanted to write about the patients and the many stories that I was a part of. It was really a unique time in history and I don’t think we should ever forget what people went through at that time because of AIDS. I am reading In the Light of What We Know Now by Zia Haider Rahmen. I recently read All the Light We Cannot See which I really loved. For many years to answer this question I would say The Bone People by Keri Hume. Then I read the Niccolo series by Dorothy Dunnett and those books are just amazing and wonderful. I always am happy to read a new Donna Leone book but otherwise I’m not too up on what is coming up in publishing. That is really the current question for me, what to write the next book about. I very much enjoyed the process, despite the length and the ups and downs. I’d like to write another book.